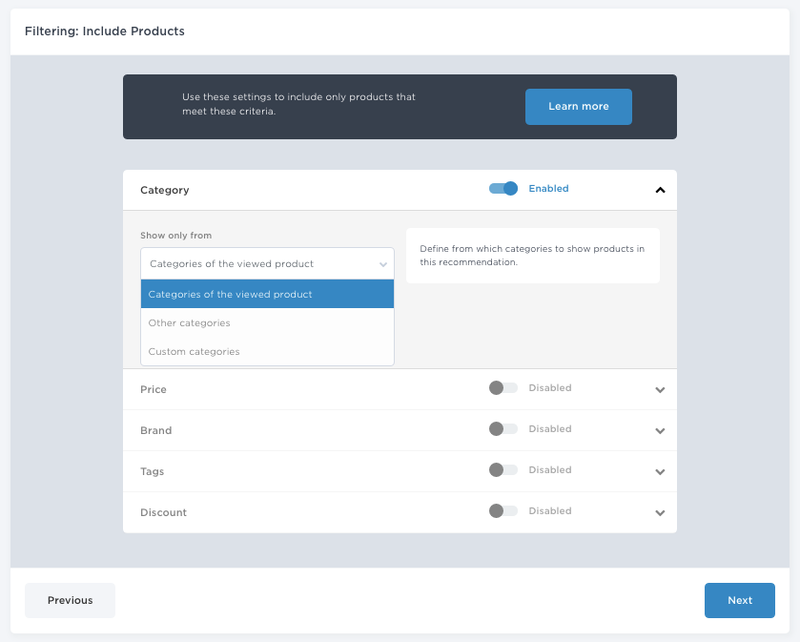 Filters featuring include and exclude rules are settings which effectively limit displayed products to a more narrow subset based on product attributes and use-cases. Settings are slightly different between different recommendation types and covered as separate chapters in this article. Category filter has three options and expected results when applied. Categories of the viewed product displays products from the same category or categories. In practice, having this selected will recommend alternative products to the currently viewed product. Other categories is the opposite to previous and effectively recommends alternative products ‘that go well together’ with the viewed one. 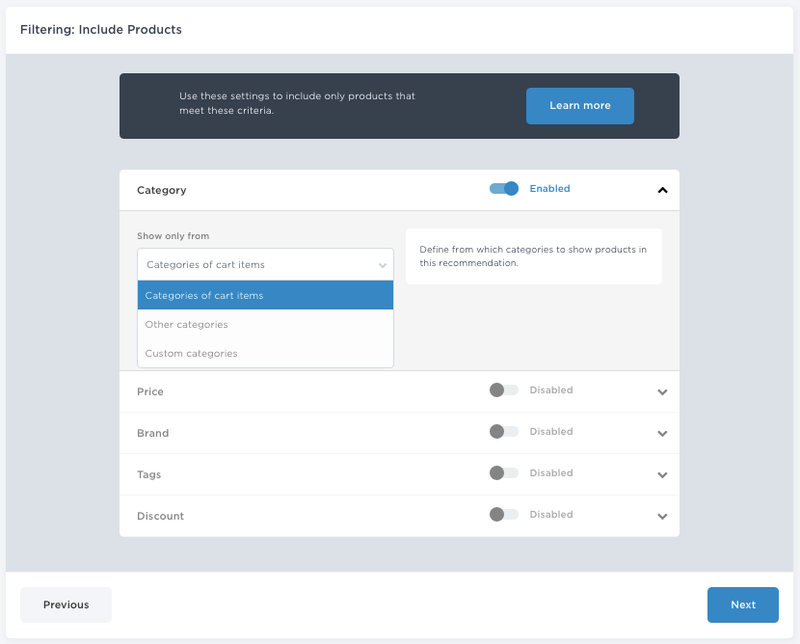 Use this setting to offer supplementary items and to allow customers to do category-scoping to other taxonomies while they still look for something specific. 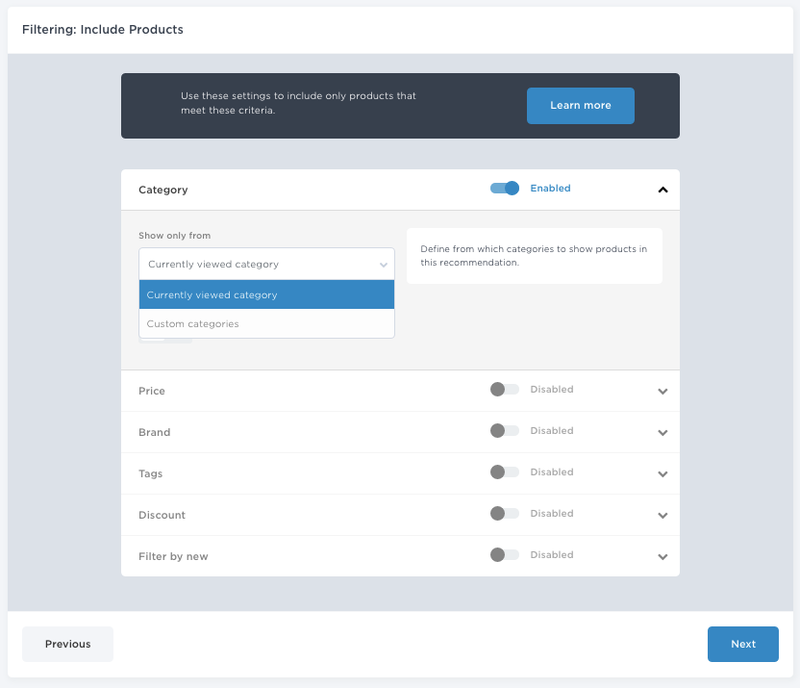 Custom categories allows to limit cross and up-sellers to a specific hand-picked product category. Price filter allows limiting the recommended products to a certain price range, using either absolute or relative values as filters. 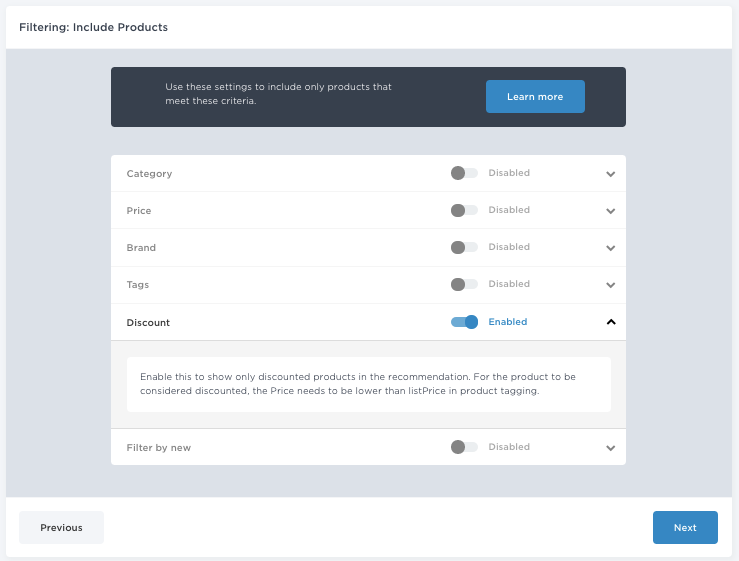 Filter allows for example to limit recommended products to a specific price range, which a customer has shown interest to, by excluding cheap budget options and too expensive alternatives, which might be less relevant to the viewed product than products in the same price range. To understand the price filter configurations better, please find the example chart below. Brand of the viewed product recommends products only from the same brand and is useful in use cases and in stores where a brand is an important decision making factor. Other than brand of the viewed product is like the previous one, but the opposite and useful to prevent overlapping in cross-sellers if more than one is used on product detail pages. Custom brands works basically as a filter and limits recommendations to products from the selected brands. Tags are custom product attributes, which allow limiting the recommended products to a more specific subset. For instance, if a gender or colour attribute is mapped and stored in a tag-field, tag-filters allow narrowing down the recommendations to products for the same gender in the same colour. Tags of the viewed product: Recommended products have the same tags (attributes) than the viewed one. Apply the filter to read a specific field by selecting one or more tag fields. Other than tags of the viewed product: Recommended products don’t have any of the tags (attributes) than the viewed one. Apply by selecting one or more tag fields. Custom tags: Recommended products feature the specific tag. Margin filter allows limiting products only to those which are profitable enough to you. Margin is calculated based on product’s supplier cost (buy-in price) compared to current selling price. Margin filter will be greyed out if Nosto does not have applicable supplier cost attribute associated with products. 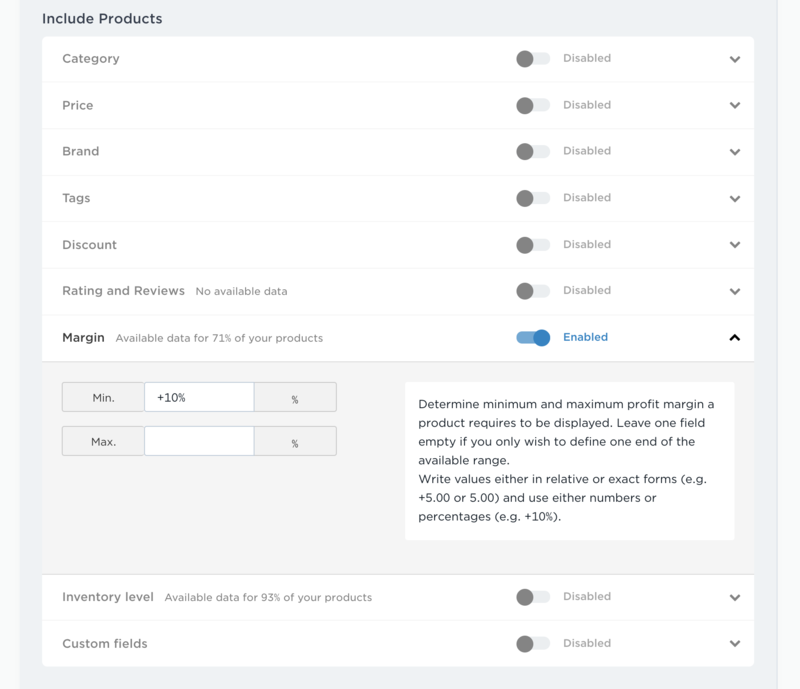 Margin filter can be used both with absolute values (Include products with 2% - 20% margin), or with relative values using +/- and specifying the percentage increase/decrease (Include products with +10% margin). 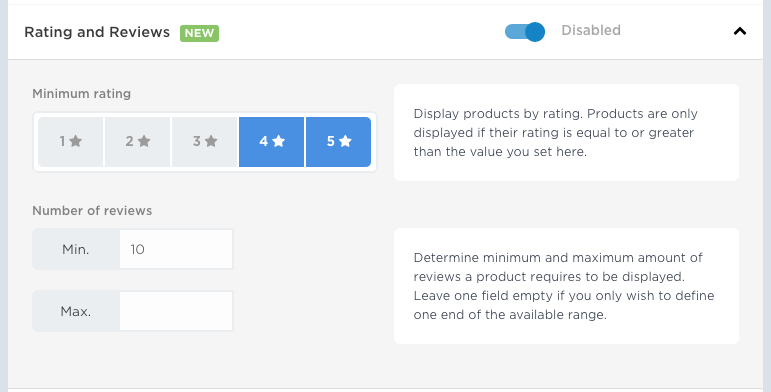 Rating and review allow filtering based on two attributes: Rating Grade (0-5) and number of reviews. Rating controls the minimum rating required, whereas min and max reviews control how many reviews product need to have in order to be shown in a recommendation. In the example below, only products with a minimum rating of 4 and with at least 10 reviews are shown. Note that rating and review filter is very restrictive as it can narrow down the recommendations only to those with good enough ratings and high number of reviews so proceed cautiously. Inventory filter allows removing products which are low in stock or alternatively creating last ones left-type of recommendation. Minimum level controls the minimum amount of products in stock, whereas max does the opposite. A setup like below would show only products with stock level of 10 or above. Recommended products are discounted when enabled. Excluding products allows limiting products based on a selected attribute or attributes. It gives perfect control over displayed products in each recommendation slot together with include settings. Settings for browsing history related work similarly to Product based cross selling. Recommendation will display the most viewed or best selling products across the entire selection. Filter settings narrow down the recommended products to a selected subset of products according to inclusion and exclusion rules. Filter has two options: Currently viewed category and Custom categories. Filter settings narrow down the recommended products to a selected subset of products. If none is applied, the recommendation will display the most viewed or best selling products across the entire selection. 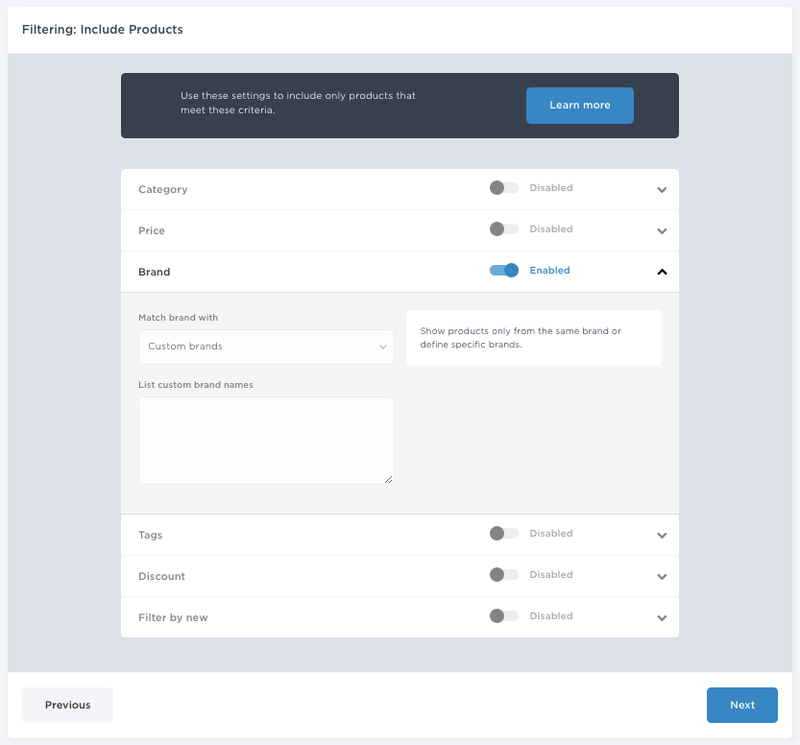 Currently viewed category is a dynamic setting and reads the context and active category from the nosto_category tag, so if this is selected, make sure that the page where positioned features the tag. Typically the recommendation is used on category pages to create a best seller or most viewed top list on different hierarchical category levels. Custom categories allow to hand pick the category or categories for a top list. Custom category top lists are typically used on a home page to showcase the top products of a timely category. Use debugger tool to review the format of the categories and add this to the text-area, one per line. Price filter allows to set a minimum or maximum price for recommended products in shop’s currency. For instance, if a minimum value is set to 49,99€, the cheapest product that will be displayed in the recommendation is at least 50€, effectively removing budget options and inexpensive accessories, which are often best sellers, but not necessarily something that a shop should promote on a primary estate e.g. first fold of the home page. Maximum value on the contrary defines the maximum price for recommended products. Brand of the viewed product is only applicable on Product Detail Pages, where the brand tag can be mapped as a part of the product tagging. According to the description, the filter limits the displayed top list to match the brand of currently viewed product. Custom brands is a similar setting to Custom categories and allows to display a top list based on brand detail. Tags are special product attributes, which are typically used to store a specific product attribute such as colour, gender or perhaps a marketing campaign detail or similar. Selecting one or more tags and defining the value in text-area reserved for Custom tags, allows narrowing the top list based on the defined product attribute(s). For example, if a gender detail is stored in tag-field 1 storing values men, women or unisex, enabling tag-field 1 and defining value “women” into the text-area, will create a top list of products for women. 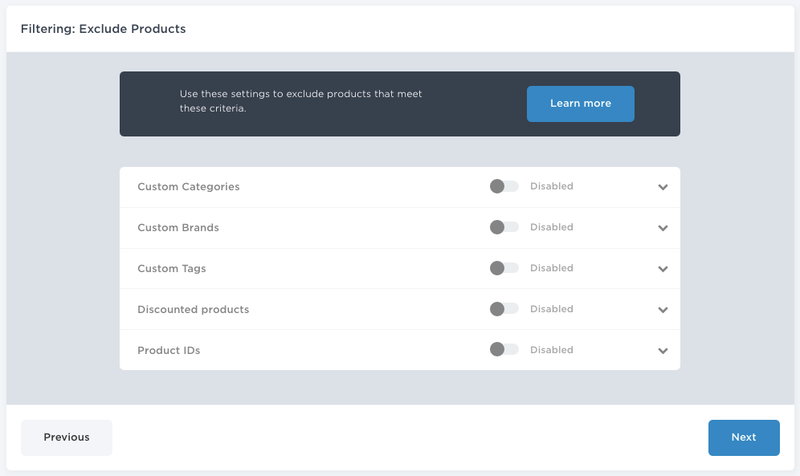 Use debug toolbar to review which product attributes you map and store in the tag fields. 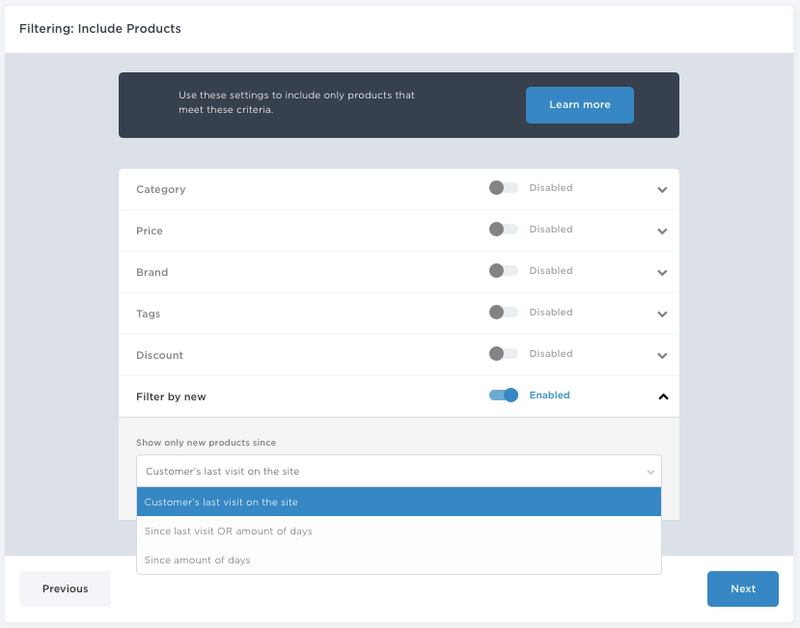 Discount filter is a simple switch, which limits the top list to display the best selling or most viewed discounted products. New In filter displays only recently added products and has three options. Customer’s last visit to the site displays products added after customer’s last visit. Since last visit OR amount of days displays products added after customer’s last visit, but if the previous visit occurred recently, the amount of days extends the time period. For example, if a visit happened 2 days ago and amount of days is 7, products that have been added in past seven days are used instead meaning the time period is extended. Since amount of days displays products added during the set time period. Categories of cart items allow to match product recommendations to products already in cart. Custom categories allow to select which product categories are displayed in the recommendation by adding the category to the text-area. Use debug toolbar to review the format of product categories. For example, if a shop has inexpensive accessory and budget categories, these could be promoted on the cart page. Price filters allow limiting the recommendations based on absolute or relative prices. If set as absolute, minimum value defines the minimum price of products in the recommendation whereas maximum sets the maximum price allowed. Relative rule settings are enabled by adding a -/+ and optionally a percent sign after the given value. Average cart item value ties the relative rules based on the average price of carted products. Descriptively, cheapest item on the cart ties the setting based on the cheapest product, whilst Most expensive item on the cart the most expensive one. Price filters allow scoping of price range of displayed products based on absolute and relative values and are arguably the most useful filter type for cart recommendation. Since business and use cases, average order values and average item values vary significantly between online stores, all imaginable scenarios can’t be covered in a manual. Based on the examples, test, review and optimise what works best on your store! A simple way to add a POS displaying budget options is to set absolute values narrowing down products based on product price. Absolute price filters applied. Following example would limit displayed products between 2 and 10 in store’s currency. Limiting results based on average cart item value will display products in the approximate range what customer is likely to buy and especially useful in stores where average order and item value varies significantly e.g. department stores. Use -/+ and % to define range. Relative price range based on average cart item value selected. Assuming that avg. cart item value would be 100€, items recommended would be between 50-150€. The same settings, but with values that would now most likely display budget options such as accessories based on cart’s average item value. If the avg. item value would settle as 100€, the recommendation would display products between 10-50€. Filter setting allows anchoring the displayed products to the cheapest item on the cart. In the example, if the cheapest item in the cart would be 10€, the filter would limit displayed products between 5-15€. As previous, but based on the most expensive item. Especially useful for stores selling consumer electronics and stores where typically customers buy only one expensive product e.g. a television, a bed or a designer handbag and in general when accessory shopping could drive a better average order value. Assuming that the most expensive item in the cart would be 1000€, the example setup would recommend products between 100-200€. 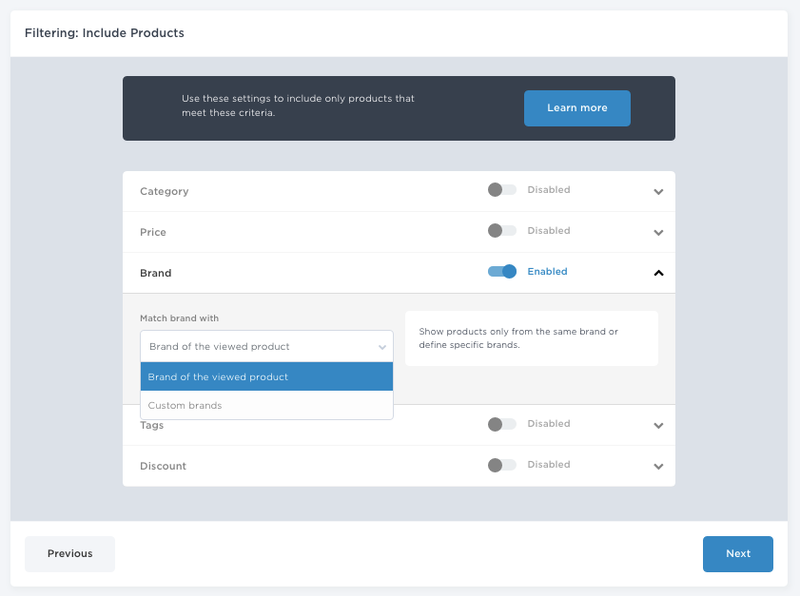 Brand filter has two options: Brands of cart items and Custom brands. By its name, Brands of cart items limit the cross-sellers in the recommendations to only to brands already held in cart whereas Custom brands allow limiting the cross-sellers to custom and pre-defined brands. Tags are custom product attributes often storing a special product attribute such as colour or gender. The filters feature two options: Tags of the cart items and Custom tags. 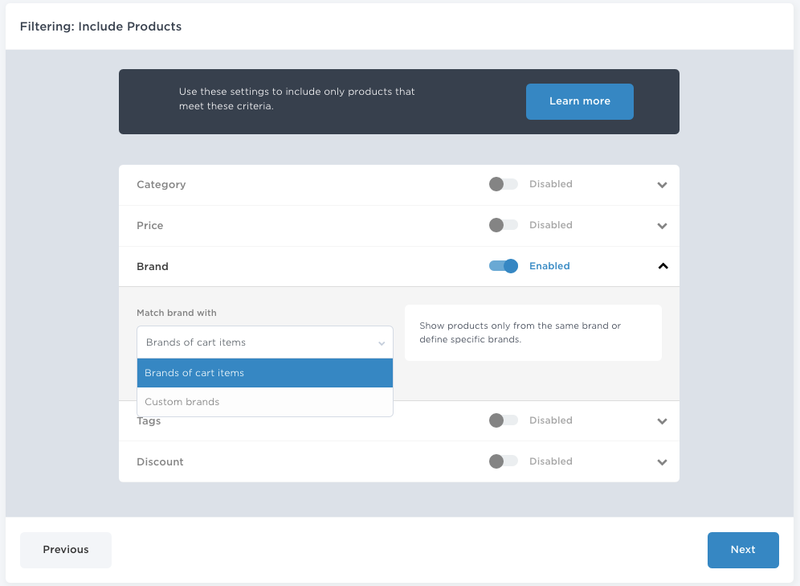 Similarly to brand filter, Tags of the cart items limit the cross-sellers to products having the same custom product attributes than the cart items. 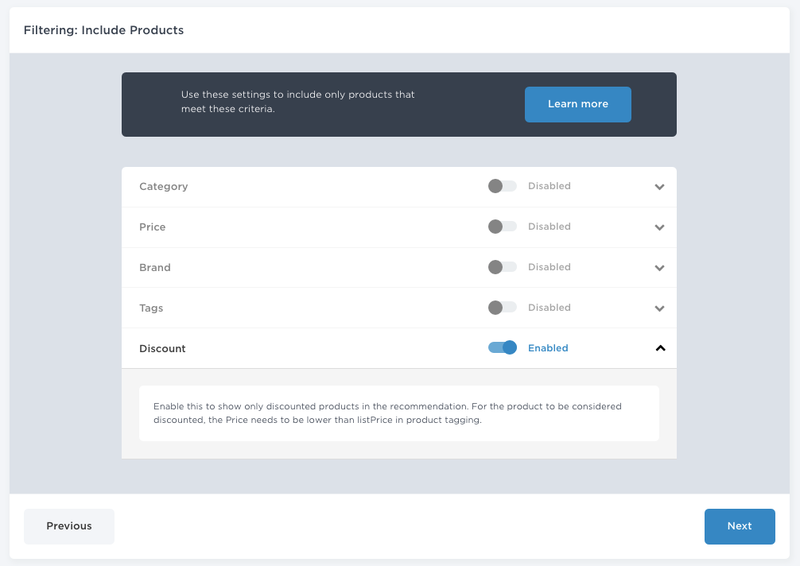 For example, if a gender detail is stored in any of the tag-fields and the selection is enabled, recommended products are only for the same gender. Proceed carefully and review with a debug tool which attributes are stored in the tag-fields as the setting can limit the cross-sellers to a very limited subset of products. Custom tags allow to select one or more tag fields and pre-set which tags the cross-sellers have to include in order be displayed in the recommendation. Set the value into the text-area and choose which tag-fields should be applied. Enabling discount filter limits the cart cross-sellers only to discounted products.